Alex Vella Gregory discovers that music and technology do indeed interact well, during a recent recital by pianist Tricia Dawn Williams. Tricia Dawn Williams and Giorgio Nottoli. It was Pythagoras who laid down the principles of modern music theory and decreed that music was really a sonic rendition of numbers and ratios. Musicians have never forgiven him since. It is a well-known fact that when musicians, present company included, are faced with numbers they simply stall. If one wants the scientific approach, here is a little experiment you can try at home. Take a group of musicians out to dinner. Get them to divide and pay the bill without a calculator. Yet, Pythagoras was right. Music is about numbers and calculations. It’s only because musicians are so used to playing that they often take it for granted. Tricia Dawn Williams’ Dialogue Between Music & Science recital (part of Science in the City 2013) sought to redress that imbalance. The idea was to highlight the mathematical principles of music, also combining them with technology. The former involved explaining fundamental concepts of harmonics and pitch. As for technology, all the pieces involved the use of electronics together with piano. Actually, it would be imprecise to call it a recital. The evening presented the audience with a deeper insight into the processes behind the composers’ creations. Before each piece, composers Giorgio Nottoli, Domenico de Simone and Ruben Zahra held an informal discussion, making the music more accessible. The programme was very intelligently chosen, as it not only presented a wide range of styles, but also different ways on how music can interact with technology. Like everything else nowadays, technology has become smaller and more powerful. The whole set-up consisted simply of three laptops, speakers, microphones and a few cables. Despite the focus on the scientific aspect, the central element was still the piano. Dawn Williams has now established herself as a leading pianist when it comes to contemporary repertoire. She has a natural affinity with the repertoire that goes beyond mere technical competence. Of the four pieces performed, the least I liked was Aitsi (1974) by Giacinto Scelsi. This was written at a time when electronic music was reaching its first golden age, and like all other art forms, it was a period marked by an experimental approach to art. The end result I felt was too clinical and became an exercise in clusters more than anything else. Of course, if one looks at it from the point of view of a study, it can be linked to a tradition that goes back as far as Renaissance keyboard music, where an idea is repeated and developed obsessively. The only problem I found was that the repetitions rarely added much to the overall impact of the piece. The other three pieces presented a totally different story. De Simone’s Half(way), which opened the programme, was a good introduction to the genre. Its use of live electronics provided a good sample of the limitless number of possibilities afforded by technology. The live manipulation also puts the technological element at a par with the pianist, resulting in what is intrinsically a duo relationship. Another very interesting and pianistically demanding work was Empty Infinity – Boundless Country from Traces of Spirit Whispers, by Steve Antosca. This time, the electronics were in the form of a recorded backing track, which although this might sound simpler, is actually very taxing on the performer, as it requires absolute precision. 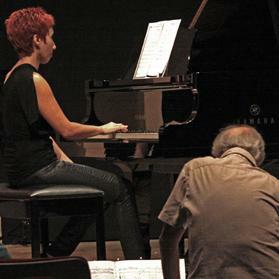 The piece also makes use of a lot of extended technique, whereby the pianist is required to produce sounds in various unorthodox manners. These included dampening the strings manually, string glissandi and use of harmonics. Williams performed this brilliantly, moving seamlessly from one technical demand to the next. Nottoli’s Risonante Notturno offered yet another perspective on music and techonology. This piece requires the use of microphones placed inside the piano, which feed into a computer programme. This programme then manipulates the sound in real time, becoming an extension of the acoustic sound produced simultaneously by the piano. I only attended one of three repetitions of the same programme on the same evening. The programme is demanding enough when played once through. To repeat it three times in an evening is nothing short of heroic. But then again, this is a pianist who believes in her cause. One only hopes that all artists approach their art with similar fervour and devotion.